Primary transformer — This is the power source of the system. It usually is a large wall-plug transformer that generates high voltage at a high current. Because it is a transformer, it is essentially a mini-Tesla coil in itself. This is a part that you cannot make, you need to buy it. Possible sources include the transformers used in neon signs, as well as ignition coils with special circuitry attached to pulse them (Neon sign transformers run on AC and thus are already pulsing). The special circuitry if you are using an ignition coil is given in my links. Capacitors — These are, basically, plates of conducting material separated by a dielectric(insulator). They are wired in series with the transformer. When current runs into these, they are able to store up the charge in their plates through an electric field that runs through the dielectric. Capacitors are, in themselves, a project to be taken on and so I cannot go into extreme detail of their design here. Tesla coils require very strong capacitors that usually need to be built. Try researching “Leyden Jars” to get an idea of a basic capacitor design. 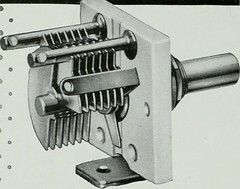 Spark Gap — This is an air gap connected in a parallel circuit to the primary transformer. Once the capacitors have fully charged up, they have built up enough vltage to be able to jump the break in the circuit here. On Tesla coils, the capacitors will charge and discharge across the spark gap thousands of times each second. Primary Coil — When the capacitors discharge across the spark gap, they momentarily complete a break in the circuit that allows power to flow into this coil. The coil consists of around ten turns of barely insulated heavy gauge copper wire. The coil is wound with a very large diameter (mine is 6 in.) and has supports to keep its shape, but it usually has no inner coil form. Secondary coil — This is another coil that consists of around a thousand turns of very fine gauge copper wire. It usually must be wound around a coil form (I use PVC pipe) and then insulated with enamel or varnish. It is placed in the center of the primary coil, but it is not electrically connected to it or any other part of the primary circuit. The two coils must be wound in the same direction. RF ground — This is the bottom end of the secondary coil. This wire is grounded to insure that high voltages do not hit the primary coil. Topload — This is electrically attached to the top end of the secondary coil. It is usually a low-resistance, round metal object that allow spark to fly easily from it. It is optional, since sparks can just jump from the top wire. Do you want to discover how you too can generate free electricity to power your house at no cost? If yes, then you might want to get a copy of the Tesla Secret. Click here ==> tesla secret reviews, to read more about this book.